As the shift from a print-centric book world to a digital one accelerates, more and more digital publishers are creating themselves. The biggest publishers, with the resources of sophisticated IT departments to guide them, have been in the game for years now and paying serious attention since the Kindle was launched by Amazon late in 2007. But as the market has grown, so has the ecosystem. And while three years ago it was possible to reach the lion’s share of the ebook market through one retailer, Amazon, on a device that really could only handle books of straight narrative text, we now have a dizzying array of options to reach the consumer on a variety of devices and with product packages that are as complicated as you want to make them. Free or very inexpensive service offerings through web interfaces suggest to every publisher of any size, every literary agent, and every aspiring author “you can do this” and, the implication is, “effectively and without too much help”. Indeed, services like Amazon’s KDP (Kindle Direct Publishing) service, Barnes & Noble’s PubIt!, and service providers Smashwords and BookBaby, offer the possibility of creating an ebook from your document and distributing it through most ebook retailers, enabled for almost all devices, for almost no cash commitment. Is it really that simple? One suspects not, since literary agencies are creating ebook publishers (for example: The Scott Waxman Agency’s Diversion) and baskets of services (for example: The Knight Agency in Atlanta) and consulting to help their authors. And a bit further upstream, ebook distribution companies (for example: MintRight) and ebook-first publishers (for examples: Open Road, Rosetta, and the granddaddy of them all, Richard Curtis’s e-Reads) are creating more alternatives, sometimes propositions explicitly addressed to the agents. If publishing ebooks to all channels were really a simple matter of uploading a file, it would hardly seem necessary to build all this infrastructure. Although the correct strategy for any entity would depend on the factors that prevail in each case, there are things it would seem that everybody entering this arena needs to know and understand. First of all, what are all the things publishers do to get from manuscript to sale, are all the steps necessary, and what do they cost? Developmental editing, copy-editing, mark-up for design, creating metadata: these are all things publishers do routinely. Are they critical for every book? Would a purchaser-reader notice if a publishing newbie left any of them out? Will the services that promise to make and distribute an ebook without a cash investment do these things well? The ebooks themselves have gotten increasingly complicated. The ebook standard epub (used for just about every ebook not intended for the Kindle ecosystem) has risen to the challenge posed by apps to be able to accommodate color and video and audio and software elements. Everybody who knows that “you get what you pay for” expects complicated ebooks to take more effort and money to create than ebooks of straight narrative text. But what constitutes “complex”? And how much more money does that additional effort cost the publisher that wants to deliver an ebook more complicated than just simple text? Marketing ebooks also requires a whole new set of knowledge and skills. The key to all ebook marketing is the accompanying metadata: coding that travels along with the file specifying its core bibliographic information and price, but which can also tell a retailer or a search engine much more than that. Search engine optimization (SEO) is the art of delivering metadata that makes the book more likely to be found in response to various searches and queries; that’s yet another set of understandings new ebook publishers have to acquire. That is just the beginning of what is possible (and therefore necessary) in ebook marketing. Sample chapters can be given away. Web sites can be invoked as partners. And authors and publishers can, and therefore must, engage in “social network marketing”: using Twitter and Facebook and commenting in high-profile streams to catch attention and gain credibility with core audiences for the books. This is more knowledge to acquire. Any new publisher will need to understand the paths to market. Yes, Amazon gets more than half of the US ebook sales and Barnes & Noble gets half of the rest. But it isn’t that way on every book, ignoring the others leaves a big chunk of the market unexploited, and things are changing quickly. Amazon’s market share has dropped by a huge percentage in the past two years.) OverDrive is the primary path to libraries. Ingram aggregates many independent stores. Baker & Taylor is opening up markets among mass merchants. Kobo is as important in Canada as B&N is in the US and works in markets all over the world. Google has the ebook ecosystem making the most serious penetration of independent book retailers. Sony is about to introduce new devices that could increase their importance. And Apple is doing its best to dominate sales to its own device holders, who constitute a large wedge of the ebook customer pie. One can go to all of these channels directly but there are also a slew of services to handle what is the increasingly complex job of delivering to and administering the multiple channels. Perseus Constellation, Ingram Digital, INscribe Digital, LibreDigital (just bought by Donnelley), and Bookmasters as well as the automated services like Smashwords, BookBaby, and MintRight we mentioned above, and others offer service packages to do that and to help with the creation and marketing needs as well. As we said at the top, nowhere is the change in publishing greater than in the agent community. What has been a stable business model for generations is now, suddenly, changing. There seem to be as many new models and approaches as there are literary agencies. That adds another thing that all of the fledging epublishers — some of which are agents, others being small publishers and authors — need to know about and understand. The relationships among authors, agents, and publishers are getting much more complicated and everybody needs to spend some time thinking that through and discussing what it means. If all this strikes you as a set of topics worthy of a day’s discussion, we’re in agreement. We think it is too. And that’s why our new Publishers Launch Conferences partnership with Michael Cader is delivering a day-long event called “eBooks for Everyone Else” in New York (in conjunction with The Center for Publishing at New York University’s School of Continuing and Professional Studies) on Monday, September 26 and in San Francisco (co-located with F+W Media’s new StoryWorld conference) on Wednesday, November 2. Not only do we have an expert-packed lineup to deliver the information, we’ve carved out time for our attendees to get their own specific questions answered by the experts and by the providers of many of the services that are part of the new ecosystem. 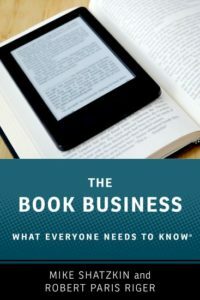 If the business of ebook publishing is part of your future strategy, you’re bound to get the knowledge and make the connections you need at eBooks for Everyone Else. Michael Cader and I will be moderating all the day’s activities, asking questions, and helping to put an enormous volume of facts into a strategic context for an audience with a staggering array of choices as to how to proceed with ebook publishing.